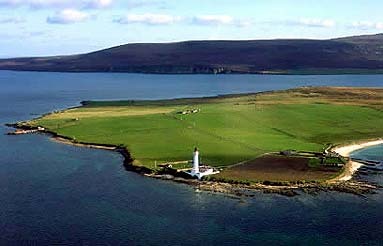 The island of Graemasy lies in the western approaches to Scapa Flow, between the Orkney mainland and Hoy. Graemsay is one of the Orkney's islands on which evidence of early Celtic Christianity can be found. Within the island's small area are two early church sites, one dedicated to St Bride, the other to Columba. 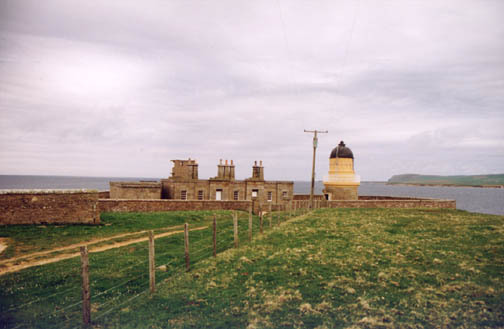 The island was at one time owned by Patrick Stuart - the natural son of the infamous Earl Robert Stuart - who was given it as a gift. Graemsay, like the rest of Orkney's islands, has suffered over the years from depopulation. The population as recorded in the 1991 census was merely 27, compared to the 214 Orcadians living an working on the island in 1841. 1866 saw the wreck of The Albion which was on its way from Liverpool to America carrying emigrants and a cargo of pottery. Fragments of the pottery can still be found at the Point of Oxan beach. Joseph Mowat lost his life trying to rescue survivors, and he is buried in Graemsay Kirkyard. Life on a Small Island - Sian Thomas's excellent, and regularly updated, blog of her life on Graemsay. Graemsay.Org - Well put together and very informative official site for Graemsay. Graemsay Ferry - Page featuring the Graemsay and Hoy ferry from the detail packed Undiscovered Scotland web site. Orkney Ferries Timetable - Times and prices of the ferry to Graemsay.